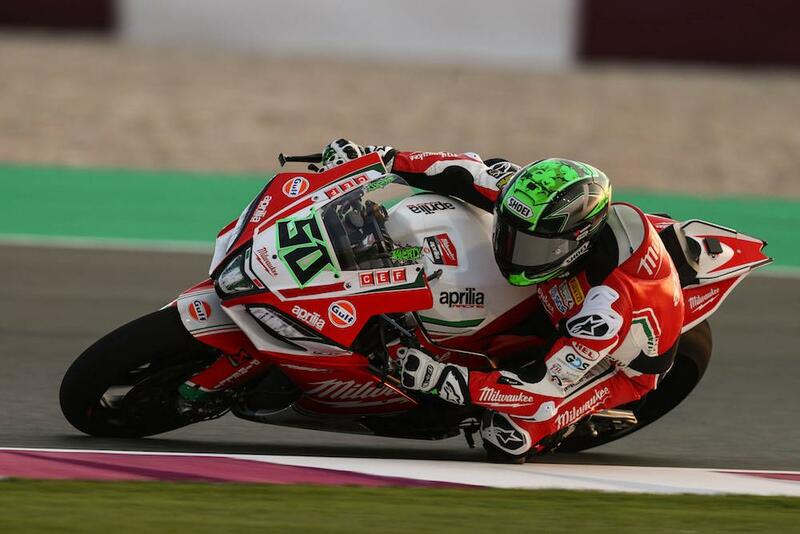 An unemployed Eugene Laverty led the way as the final round of the 2018 Superbike World Championship got underway under the floodlights in Qatar. The Milwaukee Aprilia rider was 0.183 seconds ahead of world champion Jonathan Rea to take the spoils on day one as he looks to secure his place in the series next year after being dumped by the Shaun Muir Racing squad for Tom Sykes as they prepare for a switch to BMW next season. It wasn’t the smoothest of starts for champion Rea, who missed the majority of the first session after tipping off in the early stages. Unusually dropping out of the top two in FP2, Rea’s time in the final session of the day would at least mean he led the hunt for Ireland’s Laverty. The second Kawasaki Racing Team rider Tom Sykes was third quickest as he began what will be his final weekend with the Japanese marque before that move to the factory-backed BMW squad next year. 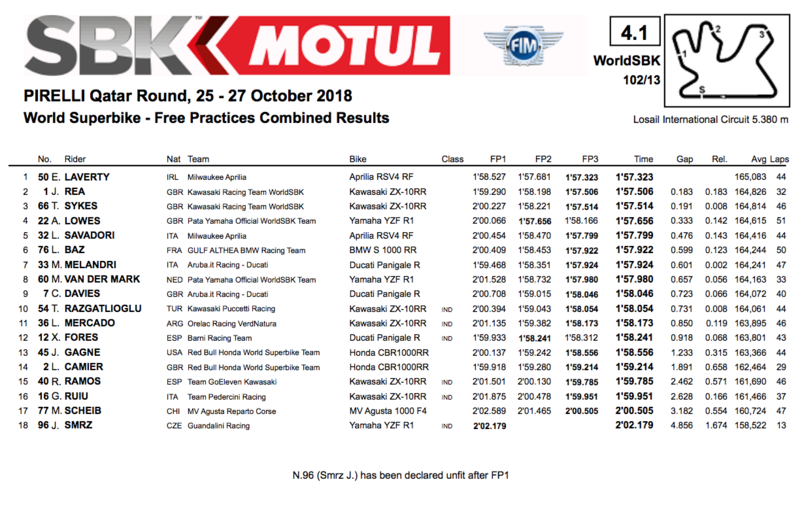 Yamaha’s Alex Lowes, who led an interrupted FP2, rounded out the day fourth fastest in an impressive start ahead of the second Aprilia of Lorenzo Savadori, who is seemingly out of work for 2019. Another rider seeking employment for 2019, Loris Baz made a welcome return to the top six for Althea BMW. It was a tough start to the weekend for Ducati, whose V-Twin racer gets its final outing in Qatar this weekend. Marco Melandri was the highest placed rider for the Italian manufacturer, placing seventh quickest on day one. The second PATA Yamaha of Michael van der Mark was eighth ahead of Chaz Davies while Turkish ace Toprak Razgatlioglu rounded out the top ten. Red Bull Honda’s torrid 2018 campaign continued with crashes for both Jake Gagne and Leon Camier in the opening day. Camer’s highside brought out the red flags in FP2, however the Briton is reported as battered but OK. The duo finished 13th and 14th on the opening day with Gange unusually leading his team-mate.